Golf Digest has included nine Nicklaus Design layouts among its 2017-18 ranking of America’s 100 Greatest Public Golf Courses, which the magazine says might be the most important list it publishes. To arrive at the 2017-18 top-100 list, a panel of nearly 1,000 low-handicap male and female golfers played courses nationwide, and evaluated and scrutinized the layouts using seven categories: shot values; design variety; memorability; aesthetics; resistance to scoring; conditioning; and ambience. Scores were averaged and totaled to identify the country’s top-100 public-access golf courses. Included among the prestigious list are these nine Nicklaus Design layouts: Harbour Town Golf Links; Manele Golf Course; Pronghorn Club (Nicklaus); May River Golf Club at Palmetto Bluff; Grand Traverse Resort & Spa (The Bear); Hualalai Golf Course; The Bull at Pinehurst Farms; Great Waters at Reynolds Lake Oconee; and, new to the list, Trump Golf Links at Ferry Point. Ranked at No. 23 is Harbour Town Golf Links, the Golden Bear’s first-ever golf course design and one done in collaboration with Pete Dye. 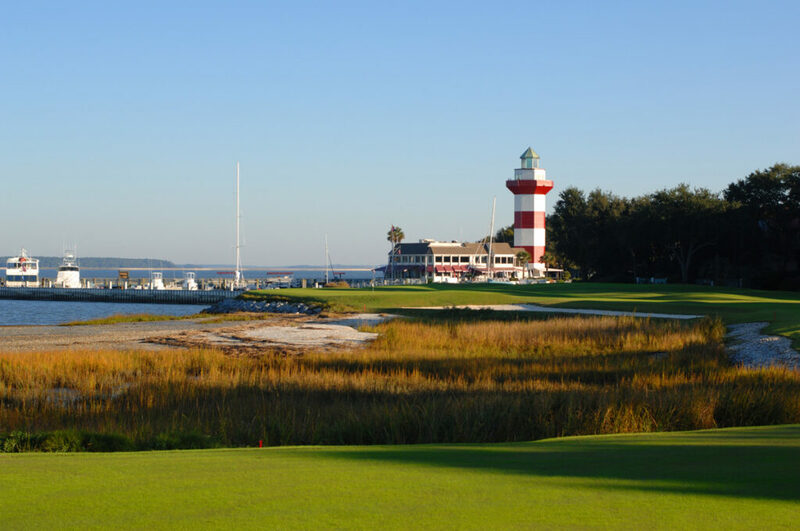 The Hilton Head, S.C., layout debuted in 1969 and is host to the long-running RBC Heritage on the PGA TOUR. Harbour Town has been ranked on the 100 Greatest Public list since 2003, when it peaked at No. 10. Manele Golf Course in Lanai City, Hawaii, ranked No. 26, boasting its highest-ever ranking in the 14 consecutive years it has been included on the 100 Greatest Public list. Jack Nicklaus designed this layout, known for its three ocean-cove holes, in 1993, and returned in recent years to tweak and modernize the layout. Manele also was ranked seventh in Golf Digest’s list of the Best New Resort Courses when it became eligible in 1994. Ranked at No. 39, May River Golf Club at Palmetto Bluff was built 35 years after nearby Harbour Town Golf Links, and is an interesting contrast in Nicklaus’ sparkling design résumé. It’s an equally low-profile layout with a number of bump-and-run approach shots, but with several Pine Valley-like waste areas and with larger, bolder greens. The classic routing has the front nine turning clockwise through forest while the back nine circles counter-clockwise. Both touch repeatedly on the wetlands of namesake May River. The course, which has been ranked in the 100 Greatest Public list since 2009 and held its all-time-high of No. 22 from 2009-12, recently reopened after a renovation led by Jack and the Nicklaus Design team. The main focus was refurbishing the bunkers, but the club also used the opportunity to bring the course into the modern era of sustainability. As a result, the course is now more sustainable, easier to play, and easier to maintain. The Bear Course at Grand Traverse Resort & Spa in Acme, Mich., ranked No. 79. The course, which opened for play in 1984 and has been included on the 100 Greatest Public list since 2011, leap-frogs over 12 water hazards between its first and last holes. At one time, the layout had the highest course and slope ratings in the country, which was part of the mandate to Nicklaus from owner Paul Nine. Hualalai Golf Course in Kailua-Kona, Hawaii, ranked No. 83. Laid out entirely on ancient, jagged lava fields, the course moves up and across slopes for much of the front nine, returns to the clubhouse at 14, and then descends toward the sea, with the often-photographed par-3 17th right on the coast. Hualalai has long hosted an annual PGA TOUR Champions stop. In 2015, when the senior event was the Mitsubishi Electric Championship, the course debuted on the 100 Greatest Public list. The Bull at Pinehurst Farms in Sheboygan Falls, Wis.—a Jack Nicklaus Signature Golf Course that opened in 2003—was ranked No. 85 on this year’s 100 Greatest Public list. The Bull was built from a legendary cattle operation, which bred champion Holsteins. It was called Pinehurst Farms. The course weaves around home sites for its first three holes, then alternates stretches of holes into thick pines and back out onto pasture. The layout includes a couple of interesting dual fairway holes and a surprising number of cross hazards. It has ranked on the 100 Greatest Public list annually since 2011. Early in his design career, Jack Nicklaus said he would design resort courses differently than championship ones. Great Waters, ranked No. 89 on the list, is a vivid example of that intent. With a routing that features 10 holes on Lake Oconee, Nicklaus and his associate Jim Lipe worked hard to vary the encounters with water. On one hole, it’s a carry off a tee; on another, it’s beside a green; while on a couple, it’s a cove in front of a green. Every encounter features a generous bailout option. Another concession to resort golfers: the greens are big but simple, with few complex contours. The course opened in Eatonton, Ga., in 1992. It ranked on the 100 Greatest Public list from 2003 to 2008 and from 2015 to present. Newcomer Trump Golf Links at Ferry Point, ranked No. 96, is one of only 10 courses—and the only Nicklaus Design layout—to debut on the 100 Greatest Public list this year. Originally planned as a private course atop a decommissioned city landfill in Bronx, N.Y., Ferry Point became a public course when developer turned U.S. President Donald Trump took over and guided the project to the finish line. Nicklaus teamed with his associate Jim Lipe and consultant John Sanford to create a U.S. Open-worthy layout in the shadows of the Whitestone Bridge. President Trump’s golf operation company leases the course under a long-term contract with the city. A links-style layout with plenty of pot bunkers and gorgeous golden rough each fall, Ferry Point opened in 2014 to showcase the beauty present in The Bronx. There are over 400 Nicklaus Design golf courses in 43 countries and 39 states. To learn more about the firm founded by golf icon Jack Nicklaus, visit nicklaus.com/design. The Nicklaus Companies is dedicated to promoting excellence in the game of golf, preserving its great traditions, and growing the game. For nearly 50 years, the mission of the Nicklaus Companies has been to enhance the golf experience, and to bring to the national and international consumer, golf-related businesses and services that mirror the high standards established in the career and life of record 18-time major champion and golf course designer Jack Nicklaus. In 2007, Jack Nicklaus partnered with Howard Milstein to help further the growth of the company and to realize the full potential of the brands and branded businesses. Howard Milstein is Chairman of New York Private Bank & Trust and is actively involved in the Nicklaus Companies serving as Co-Chairman along with Jack. Products and services include golf-course design, development of golf and real estate communities, and the marketing and licensing of golf products and services. Nicklaus-branded products have been marketed worldwide since 1962. The Jack Nicklaus and Golden Bear-branded lifestyle collection of products include: ice cream; restaurants; beverages; wine; golf academies; home appliances; flooring; cabinets; apparel; footwear; and golf equipment.